For those of you planning on taking your vehicle into Mexico . . . here are a few tips to remember. The first thing on this list is to be sure and have Mexican auto insurance. Your foreign insurance is no good once you cross the border. Remember that even if you are just crossing the border for a day, the law here is based on the Napoleonic code and you are guilty until proven innocent. That means that if you are in an accident, you will be held without bail in a Mexican jail until guilt can be assessed and damages are paid in full. The only safe way around this is to get Mexican auto insurance before you cross the border. If you have Mexican auto insurance and you are in an accident, they will only need your insurance information and you will be allowed to continue on with your vacation. Car repair : Well, this is one part of being in an accident that Mexican auto insurance can only do so much to help you with. The fact of the matter is that Mexico is a third world country and the supply line is extremely slow. That means that if you are driving a car that is common in Mexico, parts will be relatively easy to obtain and you should be on your way in about the same amount of time as it would take to repair your car in the US or Canada. However, if your car is a bit more exotic . 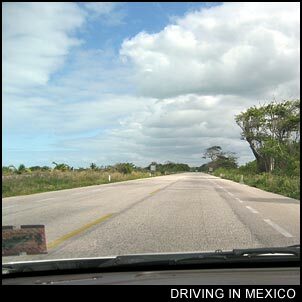 . . parts can take a month to get through Mexican customs and into the hands of your repair specialist. If you have car trouble on the road, the Green Angels (Los Angeles Verdes) are government sponsored mechanics who speak english and patrol the highways in green trucks. If you have access to a phone (or someone stops with a cell phone), their number is (01) 800-903-9200. The service is free with the exception of costs for gas or parts, but be generous with their tip since the government pays them next to nothing and they just saved you from serious trouble getting help any other way. If you are only crossing into the border towns, you won't need one. However, if you are driving into Mexico beyond the border towns, you will need to stop at the border and find out where the Migración office is. Here you will do the following. Get your Tourist Card. This is permission for you to be in country and you will need to pay a fee (around $20 USD) for it. It is advised that you make copies of your ID so that you can give them one which they will attach to your request. Get a permit to bring your vehicle into Mexico. This will require ID, Vehicle Registration, Title or proof of ownership, or a notarized letter from your lien holder giving you permission to take the vehicle into Mexico. They will charge you (around $30 USD) for this as well. Again, have copies of all of the required paperwork. They have copy machines there, but it will save you time. I learned a simple rule of thumb for costs on Mexican toll roads. . . Just figure out what it will cost you in gas to get there (approximately), then figure about the same amount for the toll roads. I did have a detailed list of how much it would cost on the site, but the costs and exchange rate change too often for it to be accurate for very long. Bypassing the toll roads . . . Don't do it man! But if you must, be sure you are driving a truck or SUV and have plenty of time because the non-toll roads will be a lot slower. Why a truck or SUV? Go to any auto body shop in Mexico and look at the line of cars with bent/broken axles . . . potholes in Mexico can kill your car (or at least its suspension).